The Facebook Home service will collect information about non-Facebook notifications and the applications users are opening, the company wrote in a blog post aimed at easing privacy concerns. In Friday's post on the Newsroom blog, the company moved to assure users that their Facebook privacy settings will not be altered by the new custom Android UI, following vocal post-launch concerns. In a Q&A style post, Facebook said Home's privacy controls are no different from the Android app and users' current privacy settings will be carried over when they download the new custom skin. It also re-affirmed that users can ditch Facebook Home after the installation, simply by turning it off in the app's settings. So far, so good, right? However, If users don't want Facebook knowing which other apps they're using on their phone, Home most definitely is not for them. Home will collect data about the apps users are opening from its new Android launcher, but will not log information about what's going on within those apps. The post wrote: "Home will only see how you interact with Home itself. For example, Facebook could see that you launched a map application using the app launcher, but Facebook would not receive information about what directions you searched for or any other activity within the app itself. 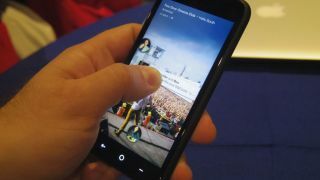 "Of course, some apps already are Facebook-enabled so that you can share your activity within the app back to Facebook. This kind of integration existed long before we launched Home, and apps that have it will tell you if it is available." For handsets with Home pre-installed on the device, like the HTC First, the service will also collect data about which apps users are receiving notifications from, which it says will improve the service. The post added: "For devices that come with Home preinstalled, Home can display system notifications, meaning that it will show notifications from apps on your phone. "Since these notifications appear in Home, Facebook collects information about the notification (such as which app is generating them) but not the content of the notification itself. We remove identifying information from this data after 90 days." The company said location services act no differently in Home as they do in the regular Android app. So while Facebook Home isn't drinking down every activity on users' handsets, there are valid concerns for folks that don't want Facebook knowing more than it already does.